This is the second part of the original post Exporting Outlook contacts with PowerShell. I will be going through the process of importing these exported contacts directly into Exchange user mailboxes, in this case we will be using Exchange 2013. If you are using an older or newer version of Exchange server, you will need to use the relevant version of the EWS API, also you will need to adjust the dll path that exists in the PowerShell script supplied. The brief steps to complete are as follows. CSV Files – If the CSV files have been created per user with the post Exporting Outlook contacts with PowerShell, the below script already includes all possible mapping for contacts properties, if a custom CSV file has been created then these mapping will need to be modified. To configure impersonation rights, you will need to complete through either the Exchange Control Panel or Exchange Management Shell. 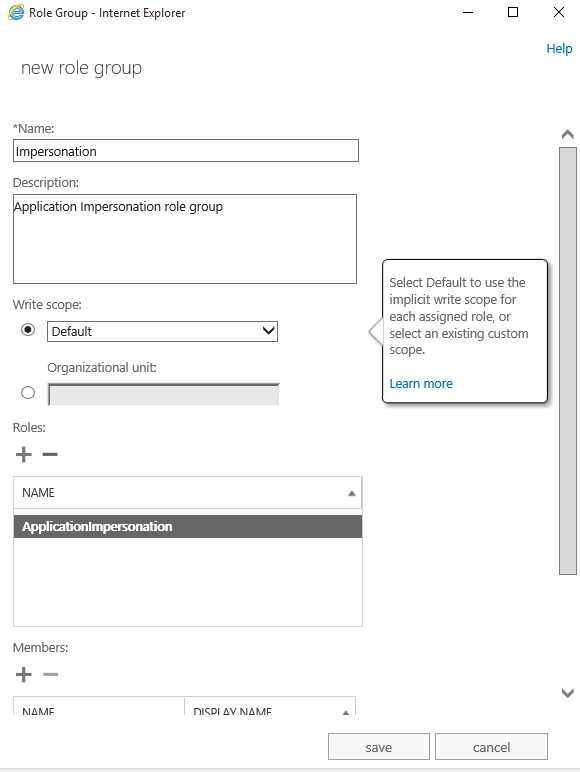 Enter a relevant name e.g Impersonation –> Leave scope as Default –> Add Role ApplicationImpersonation –> Add the user in which you will use to complete the import under Member –> Click Save. Now that impersonation is configured we can look to start the import process. In this specific use case the name of the CSV files are the name of the user account in the new domain, if you have a case where the new mailbox names differ from the CSV generated name, you will either need to change the generated name of the CSV or create a mapping between the CSV name and the new user account name. The ForEach uses the Import-MailboxContacts script which will be explained later in the post with the relevant parameters for EWS. You will need to change the EXCHANGESERVER name to your Exchange CAS server with the user name used earlier which has the impersonation rights. At the bottom of this post is the Import-MailboxContacts script, thanks to Steve Goodman and has been configured to be used with the Exporting Outlook contacts with Powershell post. The script needs to be saved as Import-MailboxContacts.ps1 and is called by the ContactImport script. The ContactMappings array has been modified to work with the export from Outlook and the script has been updated with the corrects paths for use with EWS 2.1. And thats it, if all is configured correctly, your users should have newly imported contacts in their mailbox. # By Steve Goodman, Use at your own risk. # -CSVFileName : Filename of the CSV file to import contacts for this user from. Same format as Outlook Export. # -Impersonate : Set to $true to use impersonation. # -Username : The username to use. If this isn't specified (along with Password), attempts to use the logged on user. # -Domain : Used with above - optional. # -EWSManagedApiDLLFilePath : (Optional) Overwrite the filename and path to the DLL for EWS Managed API. By default, uses the default install location. # -Exchange2007 : Set to $true to use the Exchange 2007 SP1+ version of the Managed API. # Contact Mapping - this maps the attributes in the CSV file (left) to the attributes EWS uses. # "FirstName" and "LastName" are hard coded at lines 187-197 when constructing NickName and FileAs. "Contact Picture File" = "Method:SetContactPicture"
$EWSManagedApiDLLFilePath = "C:\Program Files (x86)\Microsoft\Exchange\Web Services\2.1\Microsoft.Exchange.WebServices.dll"
# Set credentials if specified, or use logged on user. # Set EWS URL if specified, or use autodiscover if no URL specified. # Perform a test - try and get the default, well known contacts folder. # If impersonate is specified, do so. # what maps across. As some methods need more "code" a fake multi-dimensional array (seperated by :'s) is used where needed. # Will this call a more complicated mapping? # Make an array using the : to split items. # It's a direct mapping - simple!